The baseball panic is rising. 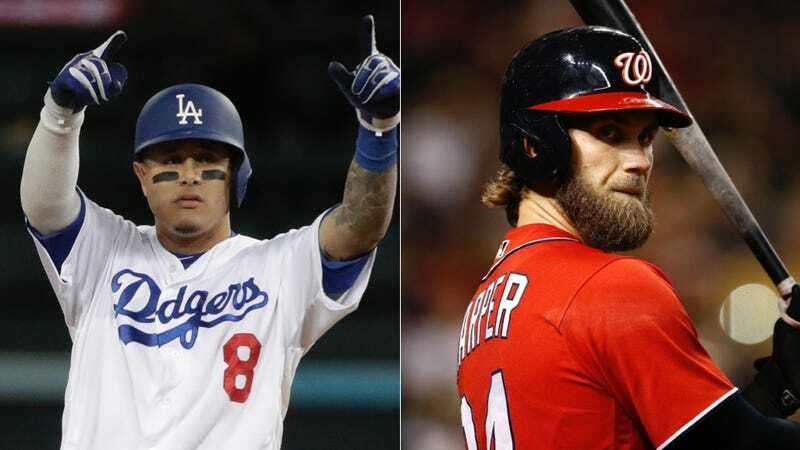 With every additional day that Bryce Harper and Manny Machado go unsigned—and Dallas Keuchel and Mike Moustakas and A.J. Pollock and Craig Kimbrel—the drumbeat strengthens: Something is wrong here. After all, as has been pointed out here, every team could use a Manny Machado and none of them would go bankrupt by signing him, while Ben Lindbergh at The Ringer notes that team GMs are increasingly dragging their feet on signings; already, we’re seeing the C-word emerge, just as it did after a similarly slow free-agent winter last year. Certainly, there are reasons to be suspicious. MLB owners are rolling in dough—league-wide revenues hit a staggering $10.3 billion last year, nearly quintupling since 1992 even after accounting for inflation. Yet owners are not, by and large, spending that windfall on player salaries as you might expect: The average MLB salary actually dropped in 2018, for only the fourth time in 50 years. And then, of course, it’s reasonable to assume collusion when this is a league whose owners have been caught colluding before. (One of those four years of falling average salaries, in fact, was 1987, the year that Expos outfielder Andre Dawson, frustrated at remaining unsigned through March, gave in and signed a blank contract with the Cubs, ultimately turning in an MVP season at the bargain price of $500,000.) So: Owners raking in tons of money, players getting lowballed on contract offers, a league with a history of illegal labor actions, and it all adds up to dirty business, right? There is, it turns out, a far simpler explanation for the hot stove league’s long night, and it has less to do with outright collusion than with a mismatch in two key ways of defining what a player is worth to a team. Baseball players, it turns out, are simultaneously over- and underpaid, thanks to the magic of microeconomics. Think a little bit about how the baseball business operates these days, and it begins to make more sense. Much of a team’s revenue flows in regardless of how the team performs on the field: national TV money, streaming rights revenues, naming-rights cash; even local cable deals are typically locked in for a decade or more, though obviously enough losing seasons in a row and that can hurt your negotiating leverage with the local RSN. And then, even for revenue streams that do fluctuate year to year—ticket sales, concessions income, sales of hideous World Series caps—MLB exacts a tithe in the form of revenue sharing, which after a hideously complex formula comes down to teams only keeping about 66 cents of each new dollar they personally bring in, making the bang-for-your-player-salary-buck that much worse. Kennesaw State University economist J.C. Bradbury issued a recent paper that concluded exactly this: “Player wages are not growing as fast as league revenue because player marginal revenue products have been falling.” (Actually rising, but at a slower rate, Bradbury clarifies, which has the same effect.) The main reasons: increased revenue sharing and shared central revenue from MLB.tv that made wins less lucrative to teams’ bottom lines. In short, owners around the league are no doubt looking right now at the Machados and the Harpers—and the Keuchels and the Moustakases—and thinking, Yeah, this guy’s great, but how am I going to make my money back on him? And if they have anyone like a Graham Tyler on staff, they’re going to be told, You can’t, because the way baseball’s finances are set up, the marginal revenue product of even the best players—the amount of extra value they are likely to put in an owner’s pocket, compared to if that owner put a cut-rate option on the field—isn’t anywhere near what they’re looking to be paid. So while outright collusion among owners is certainly possible, it isn’t necessary to explain what’s going on. It’s far more likely that what we’re seeing in recent winters is simply the hard cold math resulting from a mismatch between how much money each team is raking in overall and how much of that revenue each individual player can lay claim to being responsible for. As for whether the owners understood the long-term economic consequences of their actions, that’s less clear. “Owners have long realized that they’re their own worst enemy,” notes Bradbury, which is how baseball ended up with the reserve clause. But Noll suspects that they stumbled into this strange new world as much as the players did. Economics jargon aside, all this talk of not being paid for the value of your work should be familiar to you, the average Deadspin reader and worker under capitalism. Assuming you are not Mike Trout (if you are Mike Trout, you can skip over this part), whatever company you work for doesn’t pay you based on sitting down at the end of the year, calculating its revenues, then divvying those up amongst all its employees. Rather, it looks at what you’re asking to be paid and what it would have to pay some other schlub off the street (or, increasingly, in Bangalore or Manila), and thinks, “Is this person worth enough more to me to be worth the extra price?” So your ability to demand a higher wage has little or nothing to do with how profitable your industry is—rather, it’s about how scarce your skill set is, and how well you’re able to leverage that to demand more money. Needless to say, this has not always worked out well in capitalist history to ensure that employees share in the profits that they help create. Indeed, a steelworker for Andrew Carnegie faced exactly the same problem (albeit with a very different numbers of zeroes attached) as Brian Dozier did before signing his cut-rate deal with the Nationals: Sure, you can’t run your business without guys like him, but it doesn’t matter especially which guys like him you employ. And so it’s very easy for either a Carnegie or a Lerner to say, Sorry, but I’d rather save the money and hire some guy I’ve never heard of. The way that everyday laborers solved this problem, of course, was through the creation of unions: If owners can say no to one individual worker’s wage demands, it’s far harder to say no to an entire workforce. In sports, unions have generally worked out extremely well for players, but with some interesting limitations, especially in sports where the marginal revenue product of players is very low. The NFL is probably the best example of a league where players are nearly interchangeable—a notion that was tested during the 1987 players’ strike, where the owners with their scab teams successfully established that networks would show and fans would watch literally anybody dressed in NFL uniforms, effectively breaking the football union for all time. Not that the MLB Players Association is powerless: Baseball’s revenue model, after all, wasn’t handed down on tablets from on high, but rather was negotiated in collective bargaining, and if owners have happened upon a workaround to collectively encourage themselves to keep their wallets shut, that’s a mistake that any union leader worth their salt will want to correct. Stagnating salaries will almost certainly be on the agenda for the next labor talks in 2021—Noll has previously suggested the union could sue for collusion, but that could be a tough bar to clear if teams can legitimately argue that they’re just spending rationally. For a baseball fan, all this is no doubt frustrating, as you watch your favorite team sit on its hands when their lineup or rotation is screaming for help. (Or if you’re just really concerned about Brian Dozier’s self-esteem.) But what we’re seeing now is a renegotiation of the terms of what a ballplayer is worth, and that’s understandably going to take some time to sort out. If anything, be glad that team owners do seem to still be excited enough about taking home rings that they’re willing to spend more on players than the strict exigencies of marginal revenue product would suggest is rational, so long as their profits at the end of the day are sufficiently obscene—which has not only helped keep labor peace for a generation, but has also helped distribute a bit more of the billions of dollars you’re pouring into MLB coffers from the boring guys in suits to the marginally more entertaining guys in fancy pajamas. And if that’s not fairness, it’s the closest we’re likely to get under late capitalism. Amazon&apos;s Ransom Vs. Stadium Deals: Which Is Worse?